In France, the Armistice of 22 June 1940 seemed to confirm that matters were beyond repair and ruled out armed warfare on the battlefields. And Poland? The country had been torn limb from limb and was now fully occupied. The number of executions and deportations had increased at an alarming rate, and crematoriums were being built for the concentration camps. 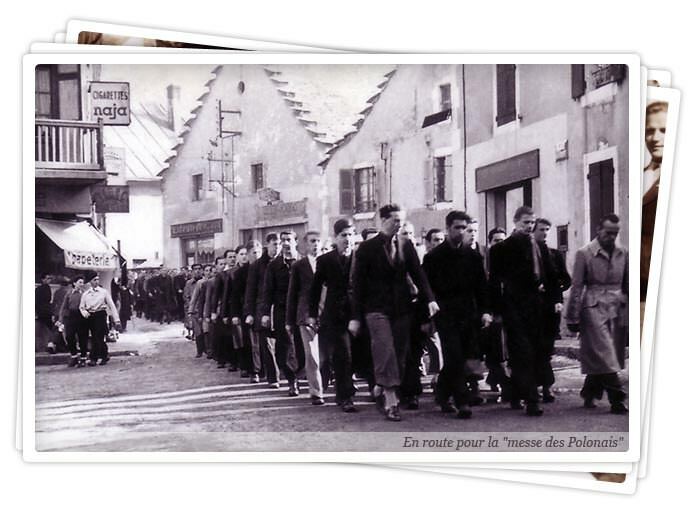 The Polish High School appeared in Villard-de-Lans between 9 and 15 October 1940. It was given a warm-hearted and understanding welcome by the local inhabitants. The fact that it was welcomed by them and in no way forced upon them is an important point to note. The school, whose numbers grew from day to day, if not from hour to hour, was intended to be a refuge for young people without an immediate future, a little like their own home, and a place where they could feel safe. It was also intent on providing a good working environment where pupils could study for their “Matura”, a qualification that would be recognised by the French government as equivalent to the French Baccalaureat. But the Polish High School was more than just a school. Within the limits of its human potential, it was a response to the historical events, both military and cultural, that were taking place. In Poland, Hitler’s reign of terror raged on. His plan was to completely wipe out the Polish nation, its culture, and its existence as an entity of free and civilised people. Libraries and museums were burned to the ground, works of art and science were destroyed. Academics and government and religious leaders were hunted down; whether writer, mayor or priest, nobody was spared. The universities were all closed down, and teaching staff from the universities of Krakow and Lwow deported to the extermination camps. Secondary education was banned, secret universities and schools were declared illegal and the penalty for anyone found to be involved in one was immediate death. Primary schools fared no better. There was no longer a single free school anywhere in Poland! Poland, deprived of its elite and bled dry of its population, was to be reduced to a people in servitude. The Cyprian Norwid High School retaliated insofar as it was able. Its inhabitants were stretched to the limit in their act of faith and hope, but never gave into despair, which they considered a sign of cowardice. This was a school of moral, intellectual, spiritual, patriotic and extremely humanist resistance. It was also a school of military resistance, ready to take up arms again as soon as circumstances permitted, and even earlier in the case of those too impatient to wait who risked the secret journey to Spain and joined the ranks of the Polish forces in Great Britain. Never were they to feel discouraged or disheartened. Headmasters and teachers, administrative and kitchen staff, farm employees and pupils… Each and every one, in all conscience, was a fighter by calling and by free choice. Whence the striking discipline that so impressed outsiders. Whence the school’s concern with ensuring that its pupils were kept in excellent physical and athletic condition. When the Vercors joined the Resistance movement, large numbers of pupils and teachers rose up alongside the French in Vassieux and elsewhere. Others helped the Allies to land in Normandy and took part in the ensuing fighting, as far as Holland. When they were not to be found on the battlefields, it was because they were in prison or the concentration camps. For example, Zygmunt Lubicz-Zaleski, the school’s first headmaster, was sent to Buchenwald, and his successor, Wenceslas Godlewski, to Mauthausen. Both returned alive, albeit physically shattered. This all gave the Polish High School its internal fabric and historical character as a school “unlike any other”. It was the “only free Polish public education establishment in occupied Europe”, as proclaimed by the commemorative plaque hanging on the walls of the Hôtel du Parc.